I have a thing for motorcycles. If nearly all the important people in my life did not exhort me to NOT ride a motorcycle because they "like me alive," I would probably be on one this moment. Preferably looking like the amazing Dot Robinson above! 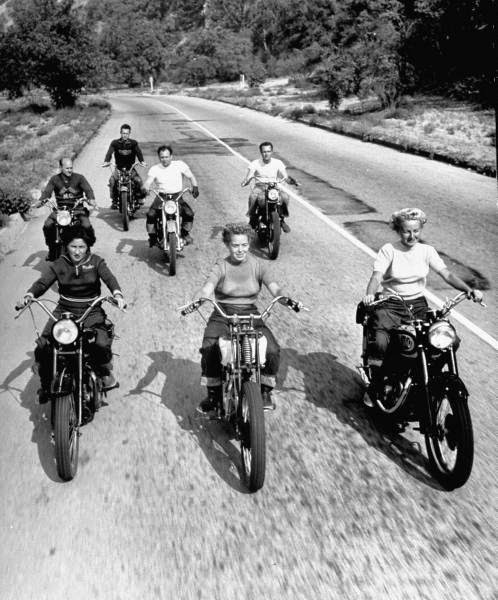 Dot Robinson is known as the "First Lady of Motorcycling" and was instrumental in the acceptance of women as motorcycle drivers, not just passengers. 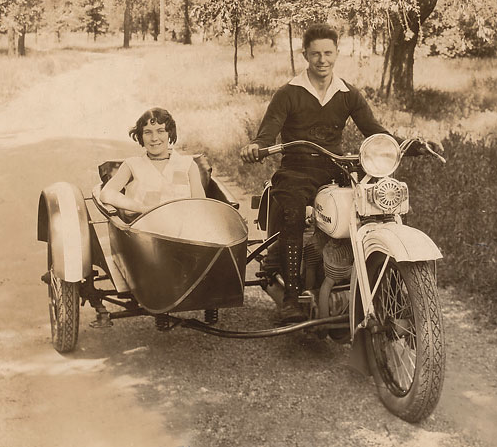 Born in Australia in 1912, she was influenced by her motorcycle-loving father as she grew up. Her father was a sidecar racer, mechanic and motorcycle designer, and dealership owner. 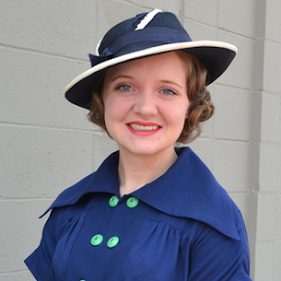 After her family move to the U.S. in 1918, Dot helped her father around the dealership as she grew up. It was here that her love for and skills with motorcycles grew, along with meeting her future husband, a frequent customer named Earl Robinson, while she was in high school. Earl and Dot married in 1931, bought their father's dealership and moved it to Detroit. 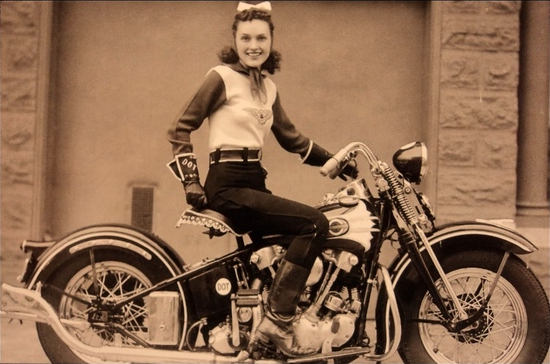 Throughout the 1930s, 40s, and 50s, 5'2" Dot competed in lots of races, particularly endurance races, on her own motorcycle. Although she encountered stiff resistance at times, she persevered and won several tough endurance runs. In a time where it wasn't considered proper for a woman to ride a motorcycle, much less drive one, Dot set out to change the perceptions of women motorcyclists, showing that one can still be an upright lady and drive a motorcycle. She won endurance runs, worked as a motorcycle courier during WWII, and assisted in the creation of the Motor Maids group. 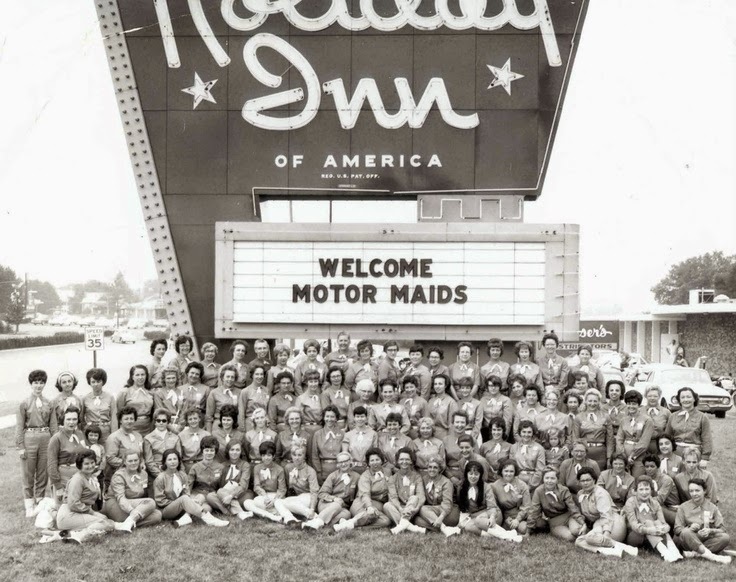 The Motor Maids traveled and encouraged women to own and ride their own motorcycles. One favorite story told by "Hap," the Honda dealer in Sarasota, FL, is a story I never tire of hearing. He tells of how he "chased that woman for two days, through mud and trees" and never caught her. At the end of the race, all the guys tramped into the local bar, but not Dot. She went to her room and got cleaned up first. "I'll never forget the picture: Dot walking into the bar in a black sheath dress and a pill box hat." Dot was always a lady. She was also known for her pink riding outfits. Although opinions vary on why she chose to wear pink instead of the black embraced by most males in the sport, a couple options may be her wish to avoid connotations with black leather-clad motorcycle outlaws shown in movies or to make the sport of motorcycling less intimidating to "civilians." 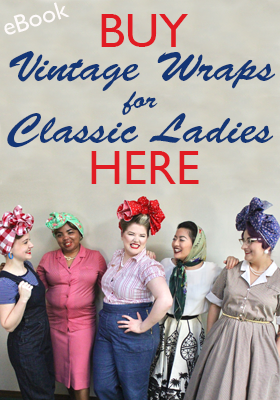 This was a time when very little motorcycle equipment or clothing was made for women, and her styles have set a precedent in women's motorcycle gear that continues today. 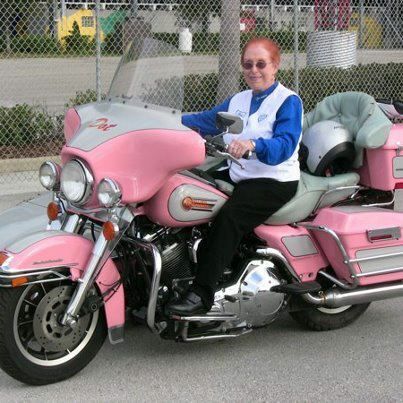 In her later years she even rode a pink Harley with a built in lipstick holder! 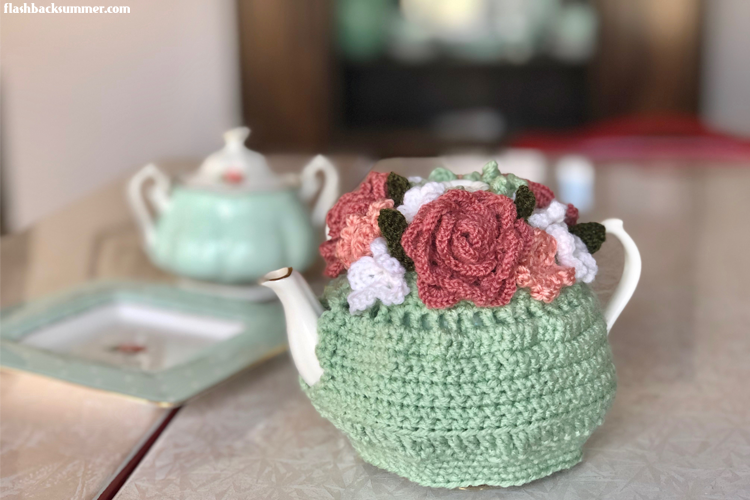 How fantastic is that?! Dot passed away in 1999 at the age of 87. Dot Robinson helped break down walls for women while still maintaining her femininity. She didn't become a man to win the approval and acceptance of men. She didn't become a she-woman man-hater or set out to prove that women are better than men. She simply showed society that women can compete with men equally in motorcycling. A woman can still be a woman and do the daring, the adventurous, and the dangerous with talent and flair. Fantastic post, sweet gal! I've always enjoyed the idea of riding a motorcycle. Unfortunately it's really not something that's physically possible for me due to some of my medical conditions, but if it was, I think Tony and I would have a set of his and her's bikes (he doesn't have a bike at the moment, but rode scooters for years in Europe and really wants to get a motorcycle one day). Really fantastic post. This was so interesting to read and great to learn something new this morning - I had never heard of Dot before this post but she sounds like one awesome lady. I would also love to ride a motorcycle myself - and probably would but I just don't have the money right now for one. Great post, I am a big fan of motorcycles, but have never ridden one due to my complet lack of balance. Anyways, the story about Dot is great and I really like what you wrote in the last paragraph about her not having to become a "man or she-woman or man-hatter". This is a prefect example that woman can do things without sacrificing who they are, a woman!